So why aren’t more people turning to the use of indigenous native California plants? Everyone who comes to San Diego is always so impressed with the landscape, neon color bougainvilleas, palms trees galore, those purple Jacaranda trees, star jasmine and every other plant found at our local Big Box store. We’ve become attuned to what the commercial growers want to feed us. I laugh every time I see a house being flipped for resale as the flipper adds lush green sod and the ubiquitous pigmy date palms. Please give me a break, can’t these folks break out of their mold and use some other plant materials. Admittedly, I am a huge proponent on using succulents (very few are native) and grasses for low water use. Doesn’t it make sense to actually use what nature has selected for us via evolution? There are so many wonderful, colorful, useful and interesting California Native plants to incorporate into the landscape. These plants belong here, they are “climate appropriate” plants. They weren’t transported here from South Africa, Chile, Australia or any other Mediterranean climate. These plants have survived over hundreds of years and were here before California was settled. Our native Indians were familiar with these plants and incorporated them into their existence. Native plants are great additions to the landscape merely due to their minimal use of water. That’s right, anytime you’ve been hiking out in the chaparral or foothills, you’re experiences our array of local native plants. These plants thrive on what mother nature provides in terms of rainfall. And for us that is about 10” of rain or less per year. Imagine that water bill if you can. Also, native plants don’t want the extra soil conditioners or amendments which cost an arm and a leg in establishing new plants. Another bonus of the native garden is its impact in providing food and habitat for wildlife. A few of my favorite California Native plants are Manzanitas with gorgeous reddish bark, pink blossoms and a variety of sizes. Add these to your landscape and be patient as they are very slow, but require almost no maintenance. Common Yarrow is actually a native as well, a nearly indestructible plant that will spread and offer a pink or white blossom. Deer Grass and Canyon Prince Wild Rye are easy care native grasses to soften any landscape. A big variety of Penstemmons offer some wonderful color. Sages or Salvias are a strong player in the native landscape. Cleveland Sage in particular has quite a lasting fragrance, one that creates a strong “sense of place” or scents of place if you will. 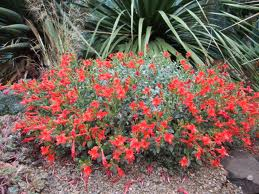 California Fuchsias are prolific in their scarlet red blooms as well. Natives should be grouped together, otherwise if you add them to your even moderate water use landscape you may kill them with kindness and overwater them. Some varieties may benefit with water once or twice a month in the heat of summer, but otherwise once established (18 months) just sit back and enjoy! California Native plants are only just beginning to emerge in our residential landscapes. I can guarantee you that you’ll see more in the future. Imagine 20 years from now how vibrant and efficient our future landscapes will be. Save the water for future generations, go native and never go back. 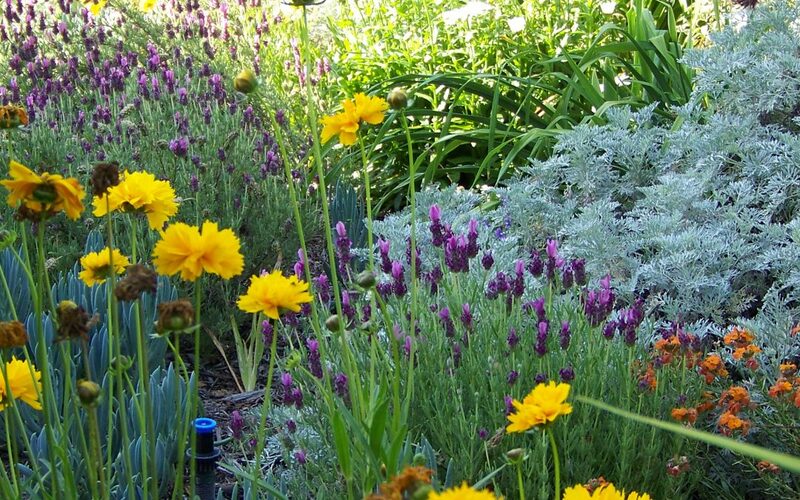 Start your own native California garden now, contact Letz Design.